If you ask me, chevron is kind of on its way out and ikat is ready to take its place as the "in" pattern. 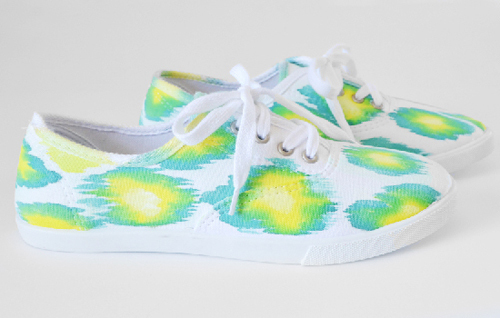 Ikat is popping up in fabric, home decor and clothes but I've yet to see any ikat shoes. 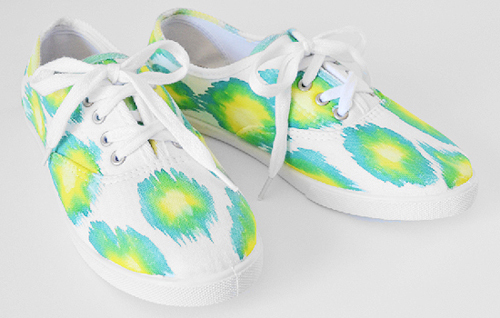 Since I had a bit of tie dye left over from tees, I decided to make some ikat sneakers. 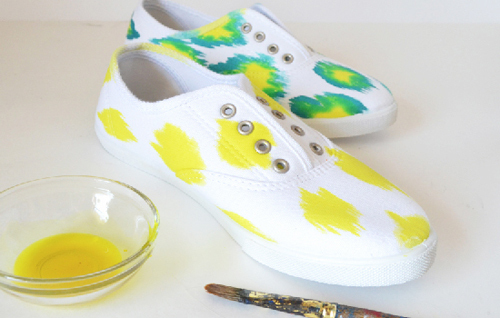 You don't have to be an artist to make these artsy shoes. First up, this is my brush... It's an older bristled brush that has seen better days. While a new brush will also work well, an aged brush will give you some interesting lines when painting the shapes for the ikat pattern. 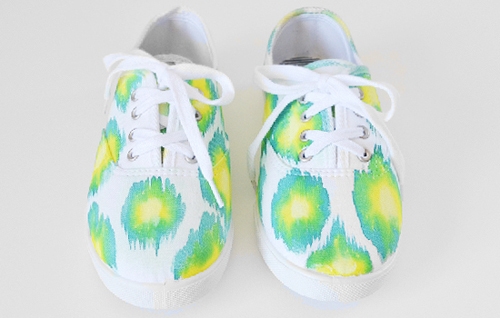 This project is great for that little bit of tie dye you sometimes have left over after dyeing shirts or whatnot. This dye remained after dyeing up a whole mess of tees with my nephews and I love that it won't be going to waste! For an effective ikat pattern, you'll need to use 2 colors but can use 3 also. Four or more may start to get too busy to see your pattern. When choosing your colors, remember that dye will blur together and create another color. 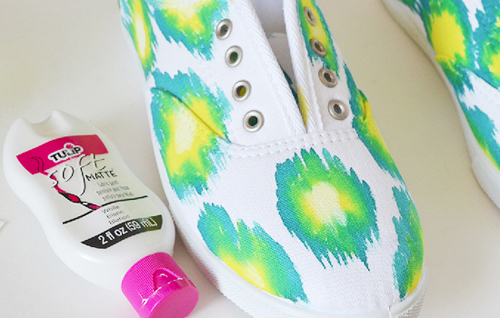 You can tell by my finished shoes... it looks like I used 3 colors of dye but I only used 2. I put my dye into a shallow crafting bowl to make it easier to access, but you can also dip your brush into your squeeze bottles. Take your lightest color and barely dip your brush into the dye. Holding your brush with the bristles vertically, paint short lines to create an irregular diamond shape. Continue the diamonds over the toe, around the sides and back of the shoe. Rinse your brush very well and then paint on a border of vertical lines around each shape. As you work, your first and second colors of dye will blend in the middle to produce your third color. Again, keep your designs irregular and inconsistent for the best results. Continue for the entire shoe. If using additional colors, keep repeating these steps. 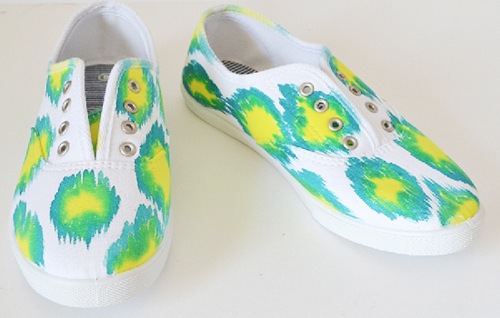 Work one shoe at a time so that your first dye color stays wet enough for a successful bleed. 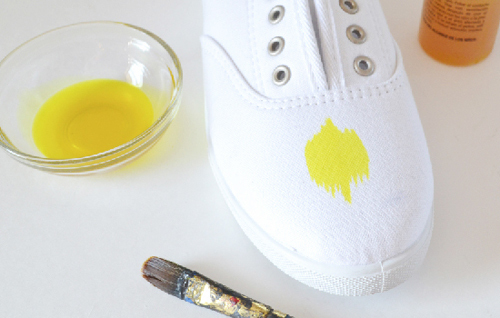 Imitate the basic size of the shapes on your first shoe on the second with all of your colors of dye. While your dye is still damp, take a small amount of soft matte fabric paint in white and paint blobs and splotches near the center of each ikat. Since the dye is still damp, the paint will take better in some areas than others, giving you nice transparency. Set the shoes to dry for a few hours. 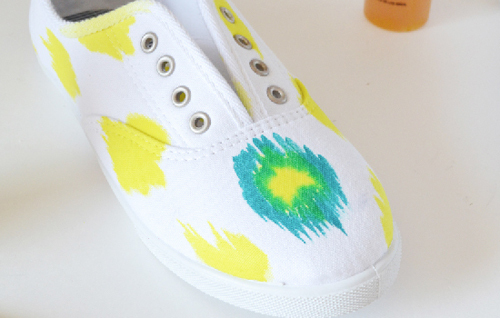 To finish you'll need to rinse all of the dye out of the canvas of the shoes. In order to keep the white area as clean and white as possible, I prefer to toss my shoes directly into the washing machine for an extended cycle with dye catching sheets. These are sold in the laundry aisle in a box that looks like dryer sheets. After washing the color on your shoes will be a bit lighter. Set someplace to dry completely. I like to place mine on a window sill in direct sun for a quick dry. If you don't want to use dye catching sheets you will need to rinse your shoes out under a strong stream (I use the bath tub tap). Rinse very, very well to remove any stray dye. 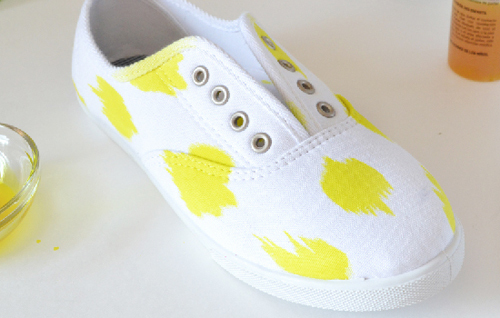 If dye is left in the fabric, as the shoes dry, the color will bleed onto the white spots and blur your pattern. When dry, lace your new shoes up and get to stepping! 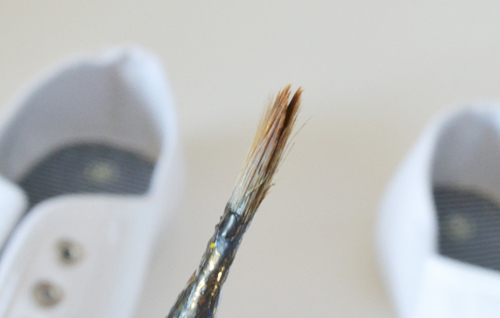 For 47 more shoe makeovers, visit my blog Dream a Little Bigger. And thanks so much for checking out my first tutorial here at iLoveToCreate! Love how these came out! So pretty! Thanks so much, very glad you like them! Have fun making those old kicks new again! 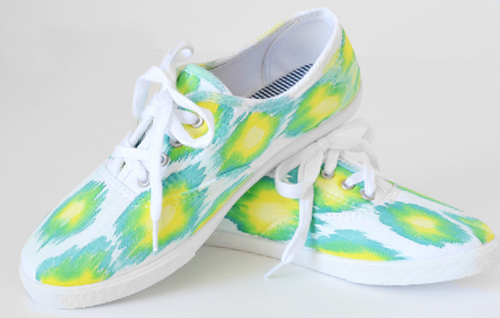 Customized shoes are the latest fashion among the shoe lovers around the world.Just take a simple shoes and make it the way you would like to wear.